Not a Football Fan? Still Go for the Food!!!! When September hits I start hearing all about football, whether it is one friend making fun of another’s team, advertisements, commercials, grocery ads, you name it! I have to be honest, and I don’t think that this will come as a surprise to anyone that knows me; I am not a football fan. I don’t know much about it, I don’t really have any interest in learning about it, but I’m pretty sure I will have a lot of game time in my future when our son is just a few years older. So, I guess I better at least pretend to like it right? 🙂 I was never into sports as a teenager, the only time I went to football parties in my early 20’s was to drink beer and eat, and since then I really haven’t bothered that much with any sports. But as a nod to my partying days, and being a secret foodie back then, I would like to offer up my first of several football party foods that should make everyone happy whether their team wins, or loses, or they just go to eat. Topping choices are endless! If it comes on a pizza you can put it in these guys! (Depending on how many you make the crust alone will be 110-130 calories. 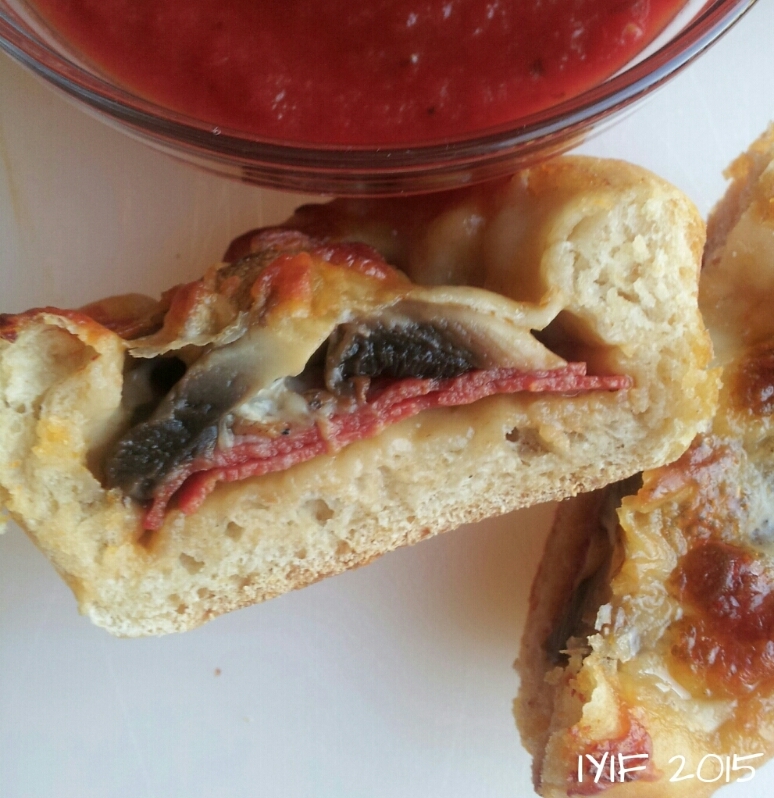 With the pepperoni, mushrooms, and cheese mine were 160ish each) Just take the dough and roll it out on a floured surface, flipping it several times so it doesn’t stick. I don’t have any round cookie cutters big enough so I just used a plastic cup with a 4 inch mouth on it to cut out the dough. Gently put the dough in a regular size muffin tin so it looks like a little dough bowl. Now I don’t recommend putting your sauce on the crust because it will get soggy, so I serve it on the side, but if that sounds like too much of a hassle put the sauce between your last layer of toppings and the cheese. For this batch I used 2 pizza size pepperoni slices (not sandwich pepperoni), 3 slices of mushrooms, and topped them off with 1/16 cup of mozzarella cheese. You can do so many different varieties though, pineapple and Canadian bacon, veggie, just cheese, meat lovers, buffalo chicken, cheeseburger, and the list goes on and on… you name it, you can top it! So, if you are a football fan, eat up, if you aren’t then bring the good food so you can sit back and just relax! Enjoy! Roll out 16 oz pizza dough on a lightly floured surface; flip a couple of times to keep it from sticking. It should roll out to about the size of 1 ½ dinner plates. Gently place the circles in regular size nonstick muffin tins so the dough comes up the side of the tins like a little dough bowl. 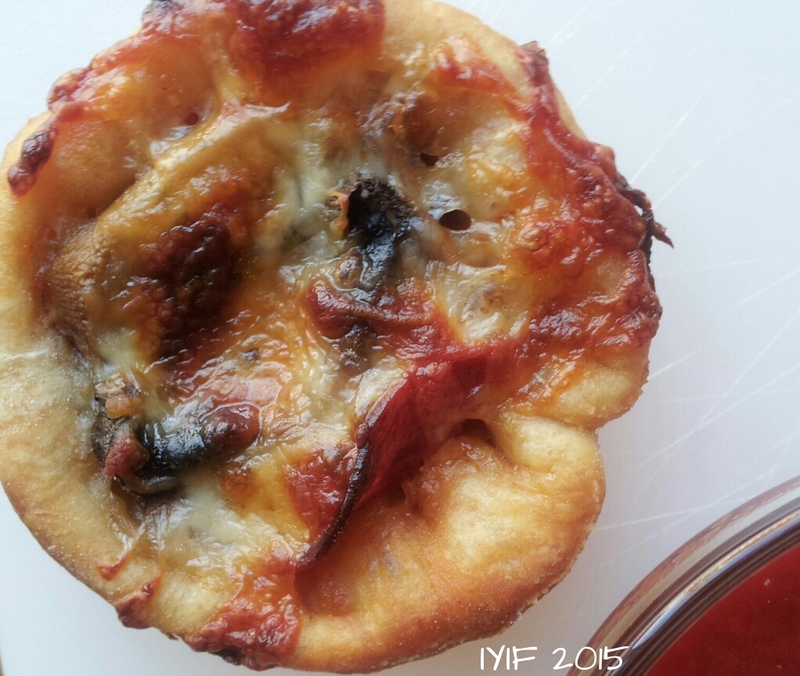 Top with cheese and pop in the oven for 20 minutes until they are a nice bubbly golden brown. Remove the pizzas from the oven and place on a serving platter, with sauce, and enjoy! These are perfect for any event! Even though I’m not a football fan I can admit that there are some pretty yummy foods at the parties. These are easy to make ahead of time, and a breeze to pop in the oven the day of. 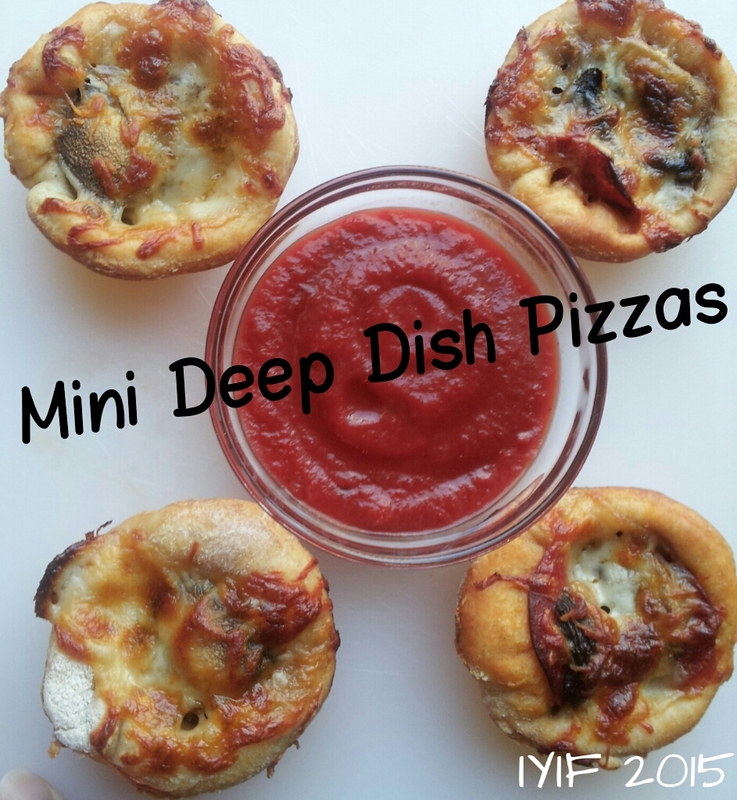 Wow your guests with a mini deep dish that they can hold in one hand while jumping up and down! I love all your recipes! This one reminded me of something similar I’ve seen for individual lasagna servings that used wonton wraps vs your pizza dough. Thanks for all the great ideas – I also want to try the “cloud” confections! Thank you so much! 🙂 Wonton wrappers are so much fun to work with! I did apple pie in egg roll wrappers (Same just bigger) and oh, yum! 🙂 Enjoy!